Mary Clemmer Ames gained national notoriety as a Washington correspondent by attacking politics in the Gilded Age (1870s-1900). Despite her success as a journalist, a mostly male occupation, Ames supported the nineteenth century ideal that a woman's proper place was in the home. Born May 6, 1831 in Utica, New York, Mary Clemmer was the eldest of a large family of children of Abraham and Margaret Kneale Clemmer. Her father's ancestors were Alsatian Huguenots and her mother emigrated to Utica from the British Isle of Man. In 1847 the Clemmer family moved to Westfield, Massachusetts where Mary attended the Westfield Academy, but her family's financial woes ended her education. Kate Field was one of the first American celebrity journalists. A literary and cultural sensation, she wrote for several prestigious newspapers, such as the Boston Post, Chicago Tribune, and New York Herald. She was an intelligent and independent woman, an outspoken advocate for the rights of black Americans and founder of the first woman's club in America. Mary Katherine Kate Field was born October 1, 1838 in St. Louis, Missouri, the daughter of an actor father and a Philadelphia Quaker mother. Kate lived with her millionaire aunt and uncle, Mr. and Mrs. Milton H. Sanford, and they financed her education in New England, and then in England. They also traveled throughout Europe - to Paris, Rome and Florence - and supported her lavishly while she became acquainted with the social and cultural elite. Ladies' Magazine (1827-1836) was the first American magazine edited by a woman: Sarah Josepha Hale. 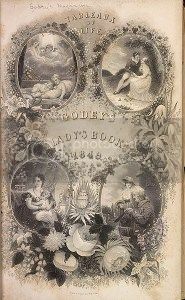 In 1837 it merged with Lady's Book and Magazine to become Godey's Lady's Book. Hale moved from Boston to Philadelphia to edit the new magazine. She did not regret the move. For the most part, women's magazines of the nineteenth century focused on concerns seen as appropriate to woman's sphere. Advertisers found the traditional home-centered woman to be an excellent customer for their clothing, cosmetics and household products; therefore, they preferred to patronize publications that would not lead women to question their place in society. What Exactly is an Editor? An editor's job is to evaluate and select content for publication, which can include reviewing, rewriting and editing the work of writers; planning the content of books and magazines; and deciding what material will appeal to readers. Throughout American history, talented women have found opportunities - or made their own - in the newspaper business as editors and publishers. America's first woman newspaper editor, Ann Franklin (1696-1763) was the wife of the printer James Franklin and sister-in-law to Benjamin Franklin. It appears that Ann learned the newspaper business from her husband soon after her marriage in 1723. Jane Cunningham Croly (1829–1901) was a journalist, editor, and women's club pioneer, better known by her pseudonym, Jennie June. She was the first woman to syndicate her column in cities across the country. Croly's writing often indicated that she believed a woman's true place was in the home, but also supported women's access to better education and employment opportunities. Jane Cunningham was born December 19, 1829 in Market Harborough, Leicestershire, England, the fourth child of Jane Scott and Joseph Howes Cunningham, a Unitarian preacher. Her father's unpopular beliefs reportedly led the family to move to the United States in 1841, when Jane was twelve. The family settled in Poughkeepsie, New York, and later moved to Southbridge, Massachusetts. Sara Jane Lippincott (1823–1904) was an author, journalist and activist, better known by the pseudonym Grace Greenwood. One of the first women to gain access to the Congressional press galleries, she used the opportunity to advocate for social reform and women's rights, while creating a path for future women correspondents. Throughout a career that lasted over half a century, Greenwood most often worked as a journalist. She and her writing were praised in many journals, including Female Prose Writers of America (1852), Female Poets of America (1859) and Eminent Women of the Age (1869), but she was often disliked for her strong opinions on women's rights and the abolition of slavery. First Female War Correspondent in the U.S.
Jane McManus (1807–1878) was a single mother and journalist, an adventurer and the first female war correspondent in American history. Whether she was land speculating in Texas, behind enemy lines during the Mexican American War, filibustering for Cuba or Nicaragua or urging free blacks to emigrate to the Dominican Republic, McManus seldom took the easy path. No matter what name or pseudonym she was using at the time, Jane Eliza McManus Storm Cazneau was one of the most formidable women of the 19th century. She foresaw a nation with equal rights for all, in a world in which representative government was the norm rather than the exception. She was not just an advocate of Manifest Destiny, she fought for it with her pen and her life. Author, editor, and journalist, Margaret Fuller (1810–1850) holds a distinctive place in the cultural life of the American Renaissance. Literary critic, editor, author, political activist and women's rights advocate - she was also the first full-time American female book reviewer in journalism. Her book Woman in the Nineteenth Century is considered the first major feminist work in the United States. Her death at sea was a tragedy for her family and colleagues, and the loss of her many talents to womankind, then and now, is immeasurable. On May 23, 1810, Sarah Margaret Fuller was the first-born child of Margarett Crane and Timothy Fuller, Jr. of Cambridgeport, Massachusetts. A lawyer and a Republican in Federalist New England, Timothy Fuller was elected to the Massachusetts Senate in 1813 and in 1818 began the first of four terms in the United States Congress, finally retiring to write. Eight daughters and sons were born to the couple, and six grew to adulthood. In 1777 a fledgling nation of United States was emerging, and its patriots looked to their newspapers to keep them informed about the Revolutionary War. Boston papers had been shut down by the British, and in New York only Tory papers were being published. After her husband's death Hannah Watson (1749-1807) assumed responsibility for publishing the Connecticut Courant, the oldest and largest newspaper in the colonies, becoming one of the first female publishers in Ameica.